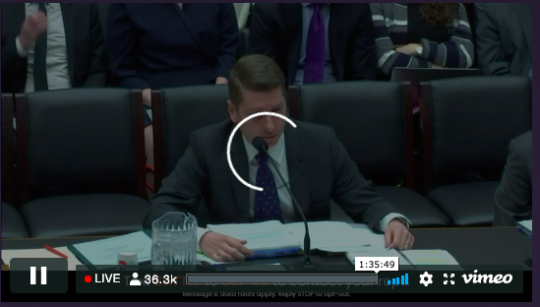 More than 300,000 people watched the livestream of the House Subcommittee on Communications and Technology’s markup and vote on the Save the Internet Act (HR 1644) today, flooding lawmakers with phone calls, tweets, and emails in support of the bill that restores net neutrality. The eruption of grassroots support had an impact, and the bill passed the subcommittee vote without issue, despite attempts by telecom-backed lawmakers to gut the legislation with amendments that would have added major loopholes for ISP abuses. In the end, only one amendment was introduced, and it was withdrawn after pushback from the majority, emboldened by the swell in activism. Digital rights group Fight for the Future helped garner massive online attention on what would have otherwise been a relatively obscure procedural vote. The group, which has led many of the largest online protests in history, built a simple widget that allowed any website to display the livestream and a link to take action on their homepage. Major web platforms like Etsy, Tumblr, Twitter, Github, Private Internet Access, Pornhub, BoingBoing and dozens of grassroots organizations helped sound the alarm. At one point nearly 40,000 people were simultaneously watching Fight for the Future’s mirror of the House.gov livestream, which crashed several times because so many Internet users were tuning in. The live counter eventually broke, but Vimeo showed that more than 300,000 had tuned in. The bill will head next to a full House Energy and Commerce Committee markup, and is expected to come up for a floor vote in April.